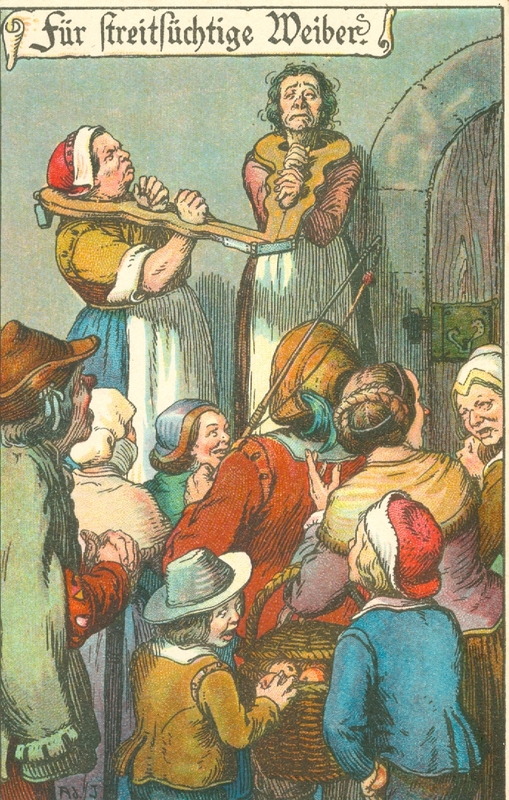 Completely outside my normal collection interests, I came across a series of Middle Ages Punishment postcards published by E. Nister of Nurenburg. I was intrigued by the series because of the attractive colors and the use of old German in the imprints that made immediate explanation for each card a challenge. I couldn’t pass them up and after considerable research into Middle Age customs and German language dictionaries as well as discussions with German speaking friends and acquaintances, I offer the following conclusions while conceding that there could be an error or two in my conjectures. I have found eight to date which seems like a logical number for a complete set but there could be others waiting to be found. In my searching I have also discovered parts of a second set using black ink on an off-white card stock. All of the black inked postcards found to date duplicate subject matter of the color set. Two women yoked together. They are pictured as quarrelsome in nature probably fighting in public. Their physical characteristics are less than attractive and they are viewed as being hot-tempered, rude and evil. The word HAGS can possibly be applied. A woman wearing a dragon’s head. Her offense is possibly nothing more than nagging a husband who in turn may be the one responsible for exposing her for public condemnation. See man at window taunting victim with straw. Man wearing the head of an animal made out of strap iron. His indiscretion is the uttering of unflattering comments in public. Middle Aged society very narrowly defined what opinions were acceptable to be discussed or uttered in public. Step across the line and you paid the price. Yoked man with a musical instrument. He is being held up to public ridicule for playing of music where his own musical skills are in question and in need of improvement. 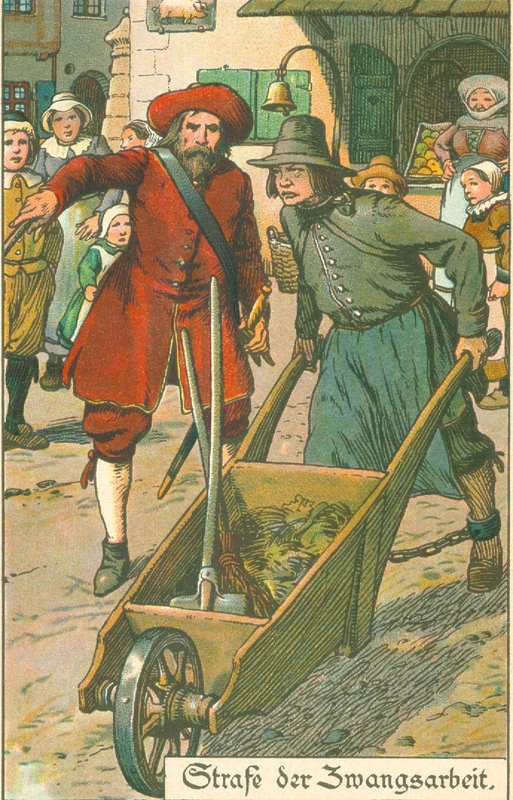 Man pushing a wheelbarrow. Perhaps an older form of what we now call community service. Some indiscretion, probably minor in scope, carried a sentence of forced labor. 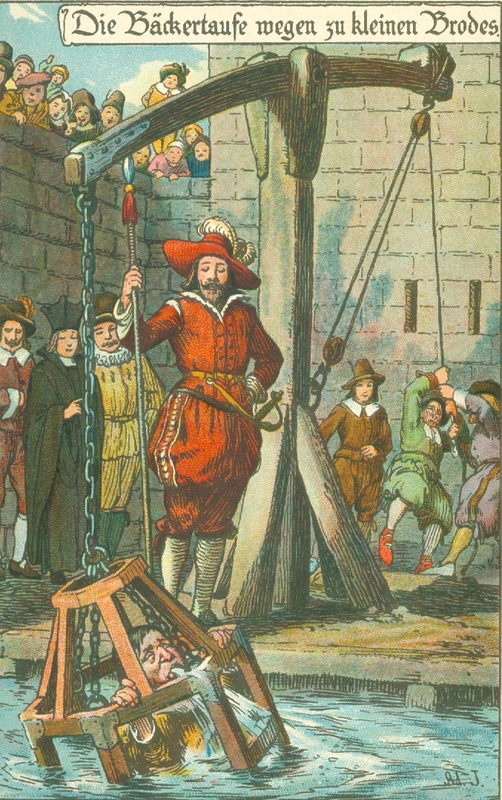 Note the chained feet, a bell for drawing attention to oneself and the tough overseer with whipping stick in hand. More serious offenses carried stiffer punishments such as imprisonment, torture or death. 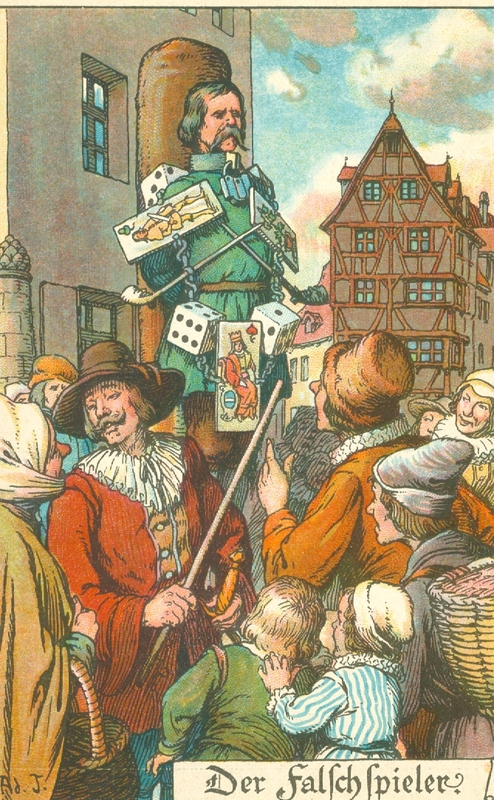 Gambler tied to post with attached playing cards and dice. Gambling was frowned upon or forbidden by both state and church, the origins of the disapproval dating all the way back to the time of Christ when the Roman guards cast lots for the clothing of Christ as he hung dying on the cross. Drunken man being ridiculed. 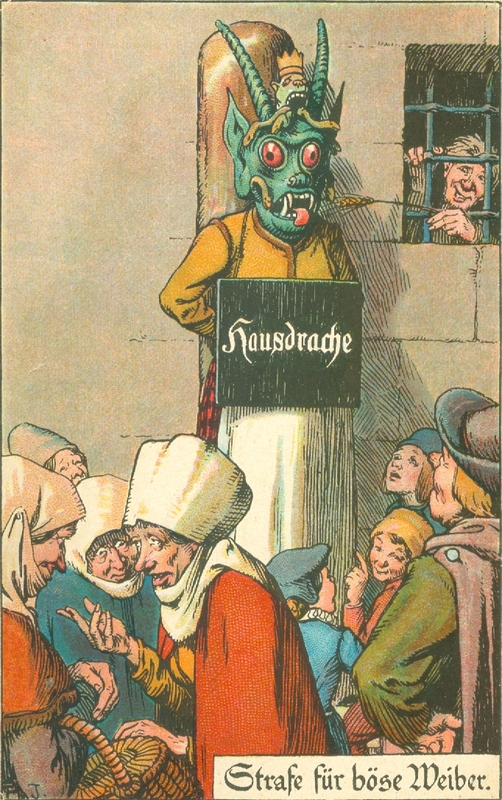 The punishment required wearing of what was called “A Spanish Collar” with subsequent parading and berating in public. This punishment was reserved for more than one crime (a couple of other possibilities are pictured on the collar). In this instance it is for public intoxication with the guilty party being depicted as having what was called “A Mediterranean Complexion”. 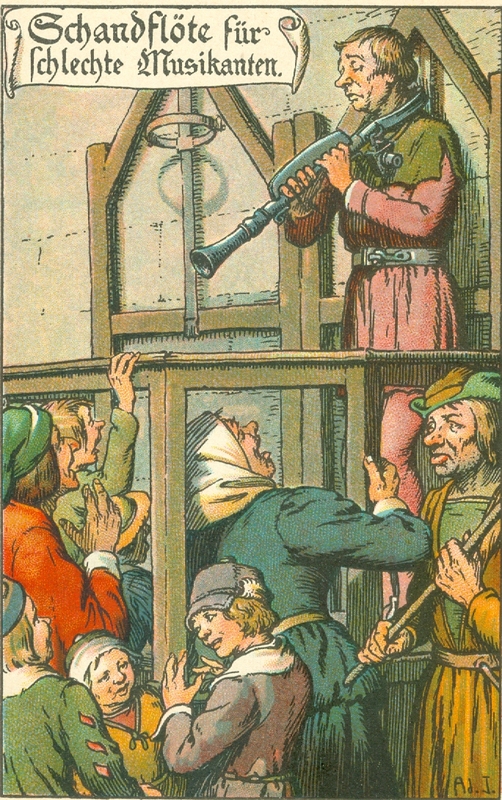 Man in a wooden cage being dunked. 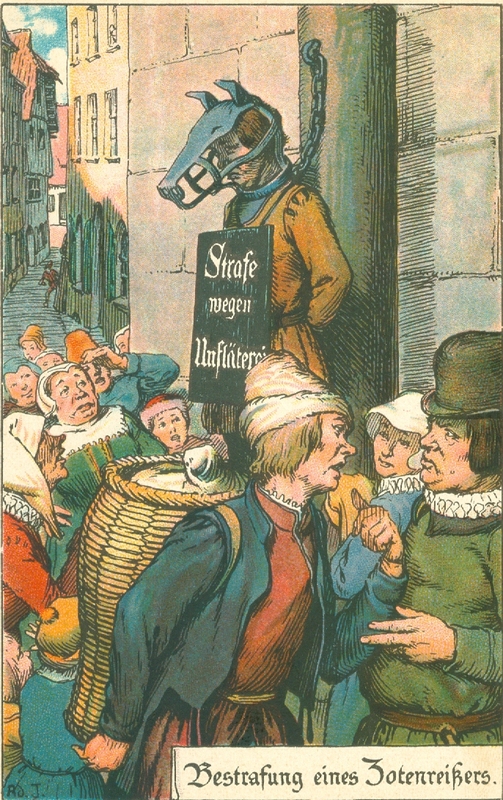 A form of Middle Ages consumer protection. 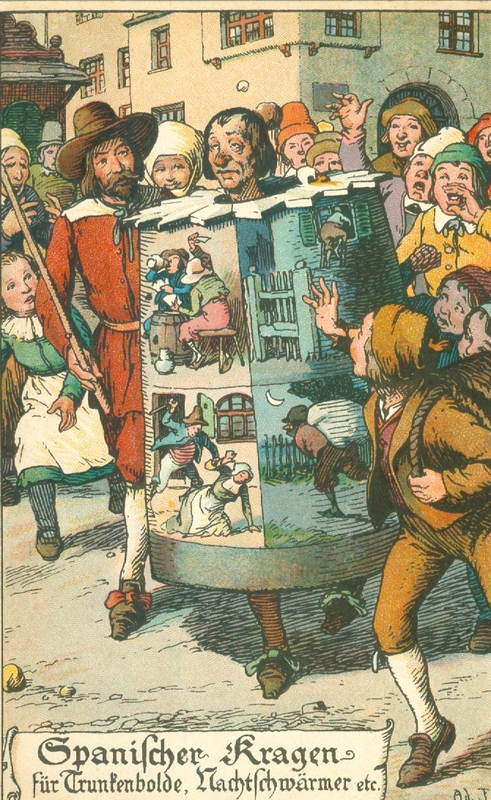 The man in the cage is a baker and laws required loaves of bread to be specific sizes and weights. He has been found guilty of baking and selling underweight loaves of bread.